Your car is not safe in strong wind! The wind is a threat to your safety, no matter which way it blows. Crosswind can move your vehicle sideways and off the road. During the tests conducted by the Polish automotive magazine “Auto Świat”, crosswind was able to move a Mercedes Sprinter by 3 meters! Such a big and sudden change of driving direction may push the vehicle to the opposite lane or off the road. Unfortunately, both situations are literally guaranteed to result in an accident. How significantly a crosswind can affect you is largely determined by the car you drive. The lateral surface area of said Mercedes Sprinter obviously makes it more susceptible to crosswinds. However, other important factors include the tire condition, drive type, mass, axle construction, and whether electronic stability systems are installed. It’s worth remembering that wind can be dangerous no matter where it blows from, so it is not just crosswind you should be prepared for. Strong headwind can make some maneuvers, such as overtaking or accelerating, significantly more difficult, too. You can also expect increased fuel consumption; in extreme cases even by half! Contrary to the popular belief, tailwind isn’t a driver’s ally, either. When driving a car in a tailwind, you will have to constantly adjust the speed to compensate for the extended braking distance. Sometimes a few meters can decide whether an accident will happen or not, so tailwind certainly won’t make your driving any safer. The braking distance is particularly important during strong wind due to the fact that unexpected obstacles, such as branches or even fallen trees, may appear on the road. Where should you take special care when driving in a strong wind? You are most exposed to unexpected gusts of strong wind in open spaces, such as highways, and outside built-up areas. The situation is a little better in the city, although when the strong wind blows, you may need to prepare for broken windows on the road, or even pieces of the façade falling off the buildings you drive by. These are extreme situations, though. During strong winds, be very careful when driving in forests and on the roads along which the trees grow. Strong winds can break branches and even whole trees, so there’s increased risk that unexpected obstacles will appear on your way. You should take caution when driving out of the forest, tunnel or other place that is sheltered from the wind; you will be most exposed to a strong and surprising crosswind that can push you off the road. How to react when driving in a strong wind? Many drivers would probably say that when a strong wind blows, you should step on the gas and reach the destination as quickly as possible. This is the worst possible solution! In a strong wind, you should drive in accordance with the road regulations, or even slower. The slower you drive, the more time you have to react if your vehicle loses grip or the wind throws an unexpected obstacle in front of you. Remember that if, when driving a car in a strong wind, you enter an area where the road is wet or icey, you should drive really slowly. You should also hold the steering wheel firmly. It’d also be good to remember the optimal positioning of hands on the wheel: these are the so-called “9 and 3 o’clock” and “10 and 2 o’clock” positions. Just imagine that your hands are, the hands of the clock, and the steering wheel is the dial. Thanks to this, you’ll be able to perform the necessary movements, such as countersteering when hit by a strong crosswind, quickly and conveniently. Speaking about countersteering, we have to make one exception: if the wind is so strong that it lifts the wheels on one side of the vehicle, then the countersteer is risky as it may make the car overturn. In such situations, instead of countesteering, you should slightly turn in the direction where the wind pushes you, unless, of course, this meand you’ll end up off the road. Let’s also remember that when overtaking in a strong wind, you should keep your distance from the vehicle which is being overtaken (preferably the middle of the second lane), and that this maneuvre may take you longer than usual. 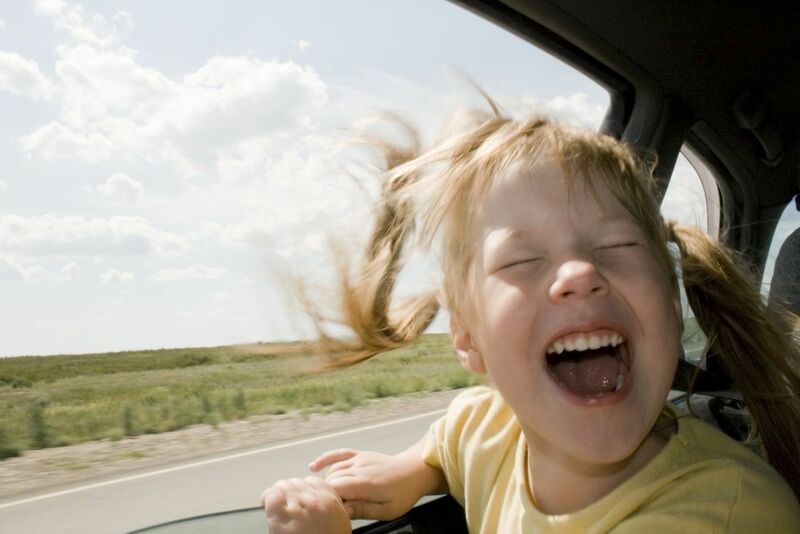 Your car will be safe in a strong wind if you prepare it well! This wouldn’t be a proper driver’s guide if we didn’t mention proper preparation of the car for the ride, too. If you ensured that the tires of your vehicle aren’t worn and are matched to the season and properly inflated, you are more likely to enjoy a safe trip, even when you drive in strong wind. The suspension should also be kept in good condition and serviced regularly. Don’t delay its repairs. If you drive in a strong wind often because, for example, your work involves driving long distances, or you simply live in a mountainous, windy area, and you’re going to buy a new car, it is worth considering a purchase of a model equipped with electronic stability systems. In newer models quite often you’ll find a crosswind driving assistant, available as an optional extra. Many cars have ESP systems installed, too; it’s a technology that improves a vehicle’s driving stability. However, before purchasing, you should read the automotive press and the Internet and learn how the ESP system of a given manufacturer works: not every device will support your car in a strong wind in the same way. In a strong wind, park your car wisely! Finally, there’s one more important matter to discuss here. A strong wind is a risk to your car whether you’re in or out of the vehicle, so if the weather forecast says “windy”, do not park under trees or power poles. These can irreversibly damage your car if they fall and hit it.